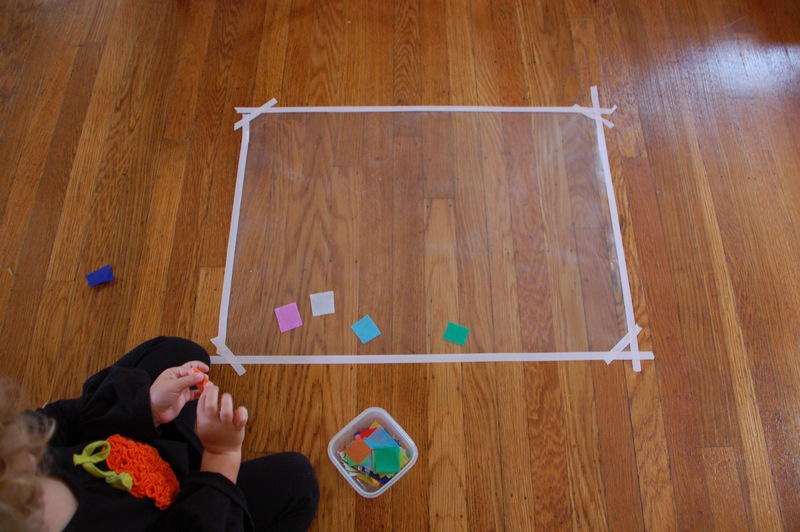 This is a fun early building activity for toddlers and preschoolers. 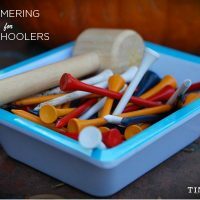 If you have a child who likes to bang a hammer, this project is for you. It’s economical, contributes to strong hand-eye coordination, and can give you hours of fun. My neighbor Liz is an incredible parent and preschool teacher. 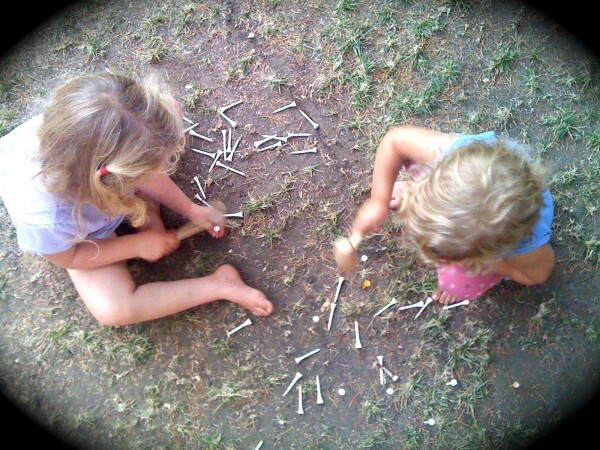 She introduced us to this early carpintry & building activity this summer, and my daughter has asked me to buy her golf tees on numerous occasions since. We don’t play golf, so I finally got my act together and ordered this set of tees. And now that we own a bag of 75 golf tees? 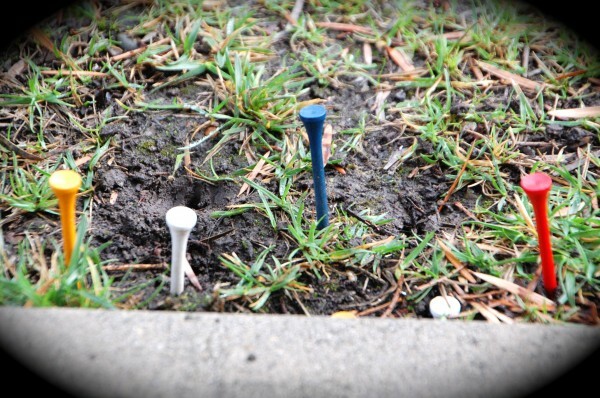 It’s nice to have a bowl of tees in the yard in case the mood to hammer strikes. Ouch, no pun intended! A handful of tees and a toy hammer is all it takes. This hammer is part of the Plan Toy Punch and Drop Set and the tees are from Amazon. When my daughter was younger, I would poke some tees into the earth to help her get started, but now she wants to do this step herself. For easier hammering, we like to work with soft or wet dirt. 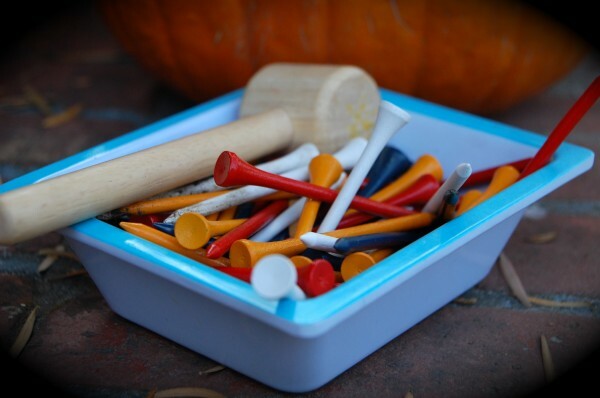 Our favorite Golf Tees were found on Amazon. I like how this pack is multi-colored. Kids love this! Wooden Hammer came from this toy. 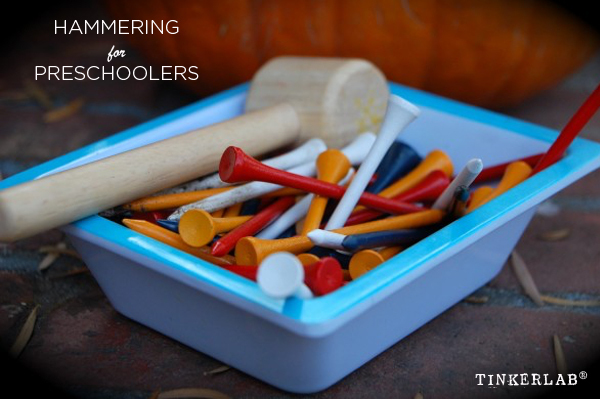 Montessori Services sells a hammering set, but you can also order a hammer and tees separately. I would recommend just the tees and hammer. If you don’t have access to dirt or want to make this an indoor activity, a good alternative is to pick up or find a huge chunk of styrofoam. 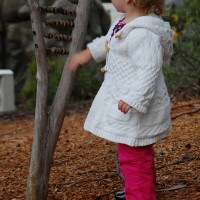 Older children may enjoy hammering real nails into a tree stump or piece of scrap wood. Pre-hammer holes into a piece of wood. 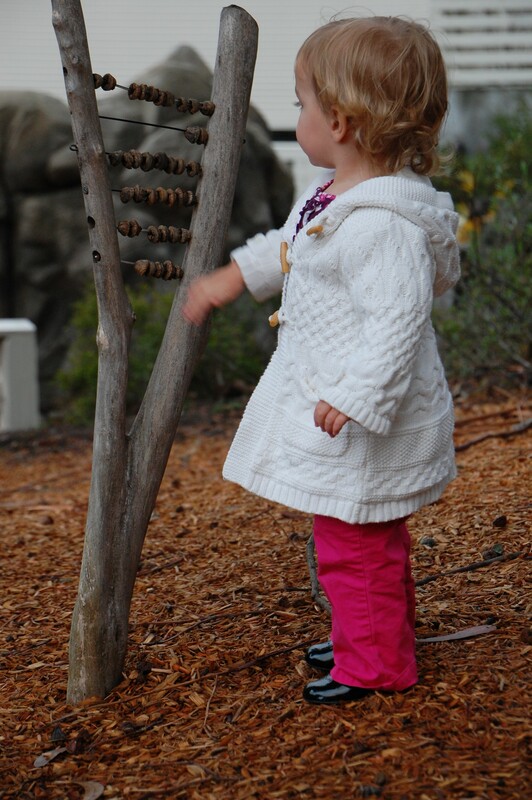 Using a screw driver and large screws, show the child how to screw into the hole left by the nail. You could also practice screwing holes into a bar of soap. 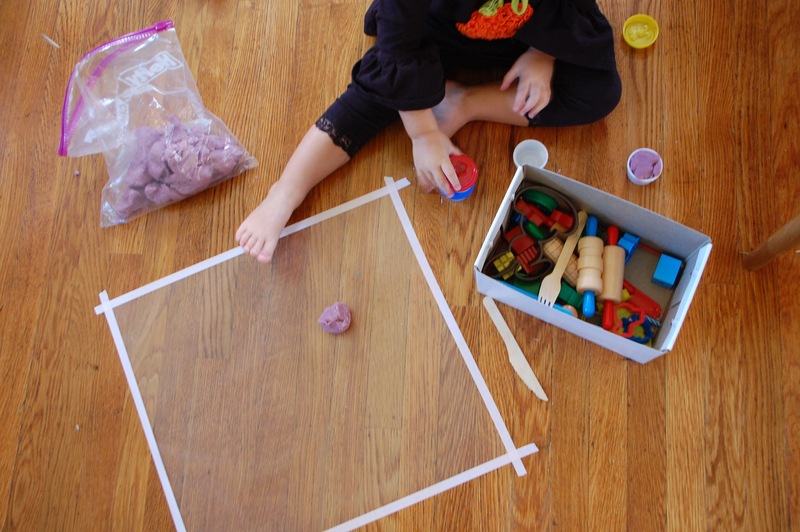 Cut small pieces of sand paper of various grades, and set out some blocks for the child to sand. Discuss the different textures of the papers with words like rough, course, and smooth. Since making Sticky Autumn Collages a couple weeks ago, we’ve been addicted to contact paper. And thank goodness for that because I needed some serious validation for buying seventy-five feet of the stuff!! Despite the semi-gloomy weather, we could not be stopped from making art with the word “sun” in it…this is a strong activity for even a rainy day. In fact, it’s a good indoor project that may even thrive with a side of hot apple cider and pumpkin bread. 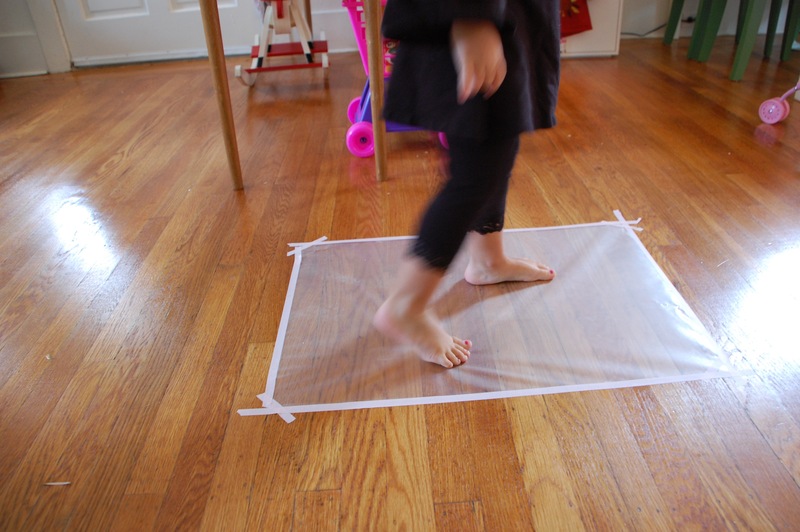 I cut a large piece of clear contact paper and taped it securely to the floor. N didn’t need a lot of encouragement to walk on it because this is just inherently fun and feels weird. Lots of giggles or gasps. I credit MaryAnn Kohl with this idea. Then we stuck the tissue shapes to the contact paper. The contact paper is super-sticky, so once the tissue is down, it didn’t come back up again. For reals. N got into this, and especially enjoyed folding and crumpling the tissue before placing it on the sticky paper. 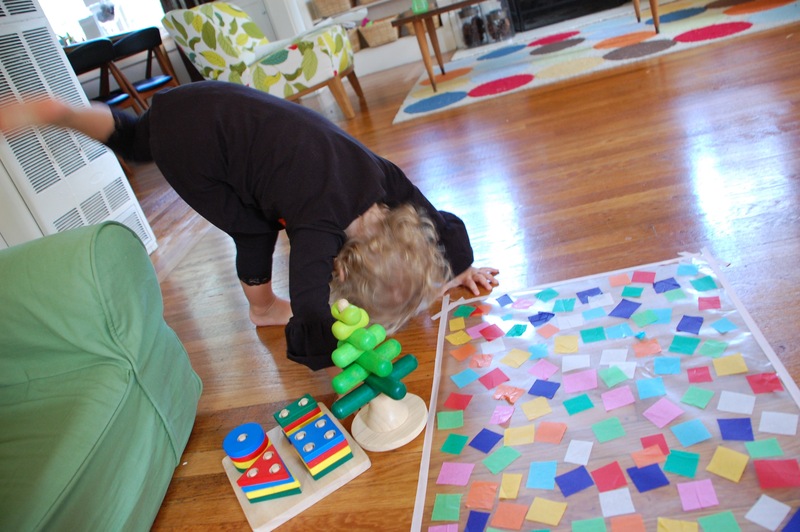 While I finished adding all of the pieces, N took a yoga break. Of course. 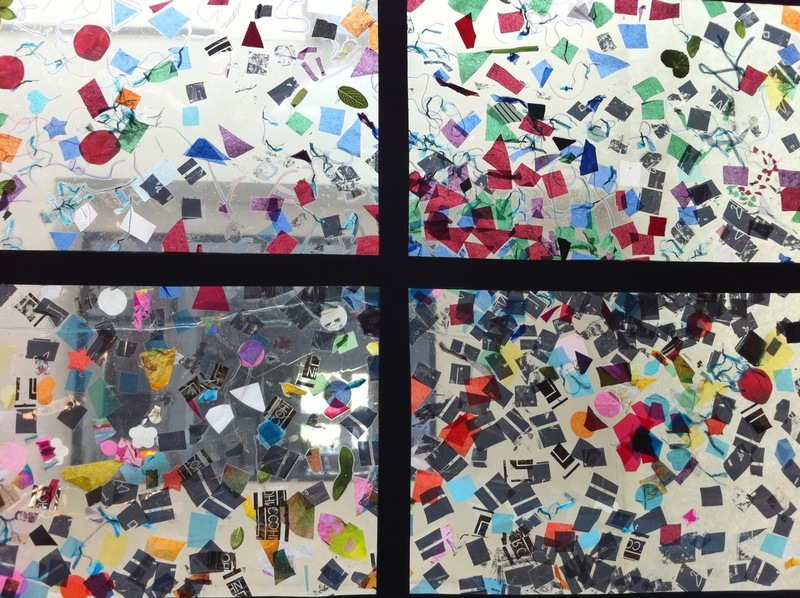 Then we removed the tape and stuck the contact paper directly to a window. So pretty. When the Suncatcher was done, I got a request for “Contact Paper and Play Dough.” How could I refuse? Turns out the play dough doesn’t stick. And then, N wanted to know what would happen if she sat on the contact paper. She came up too. Whew! 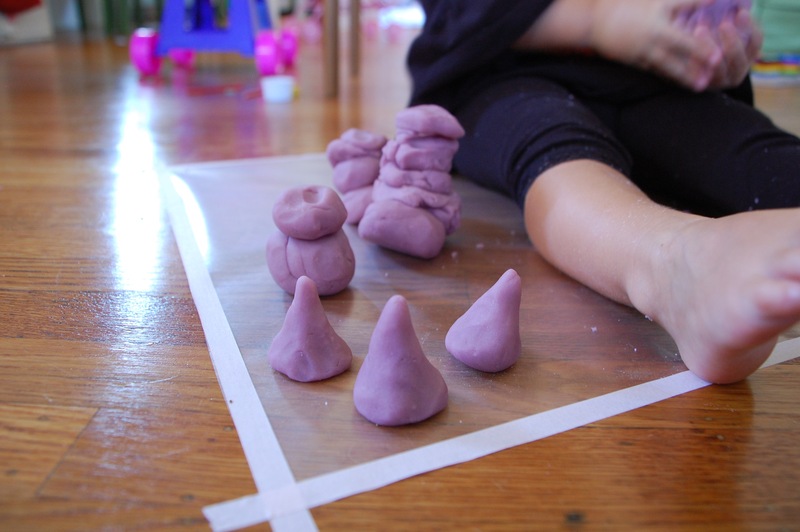 Somehow, this all morphed into making play dough snowmen with “many teeny-tiny heads.” I love the stream of conscious that guides children from one moment to another. You never know where you’re going to end up. 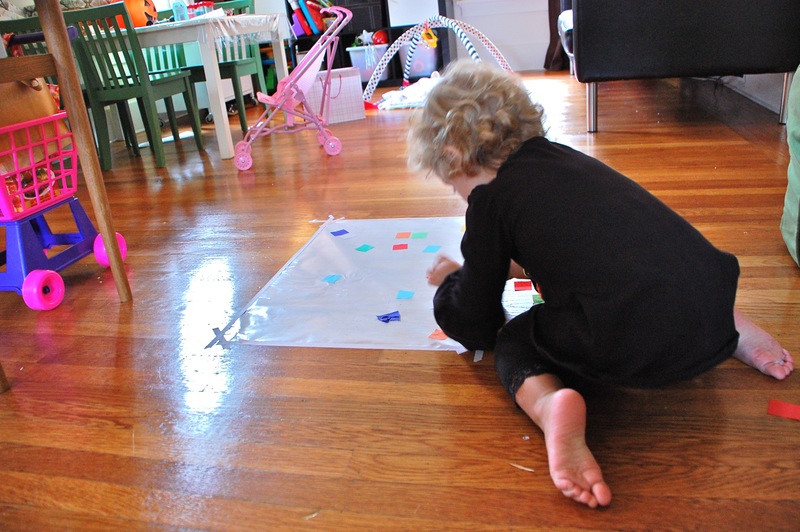 Do you have a favorite activities that includes contact paper? 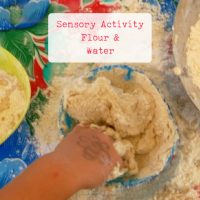 We recently attended a back-to-school event at my daughter’s preschool, where her teacher shared a funny and inspiring story that involved a messy flour and water sensory activity. 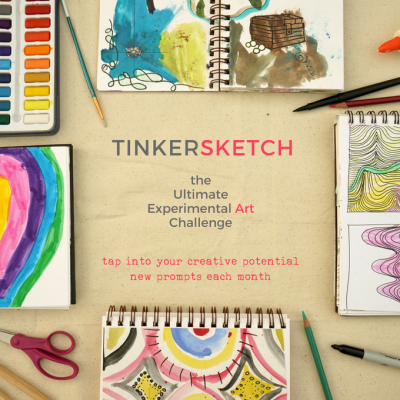 With my ears on the alert for fun and thoughtful creativity-builders, I knew immediately that this was something we had to try. 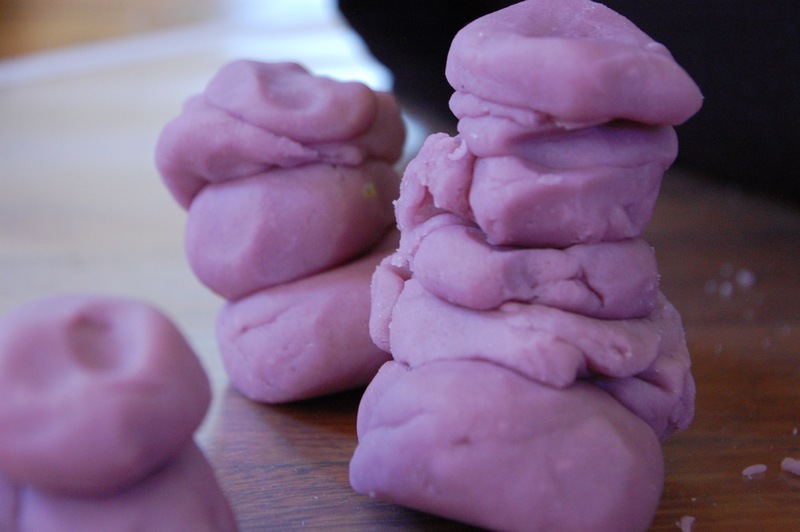 It’s unbelievably simple and requires no art supplies…all you need is flour and water. It’s so straightforward, in fact, that I’m almost embarrassed it wasn’t already part of my repertoire. 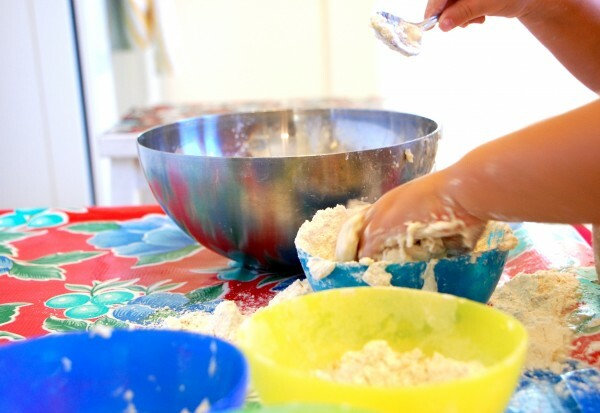 Strip your kids down and get ready for some messy flour fun. 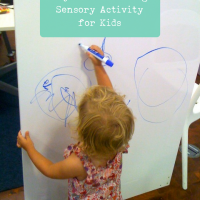 This activity is all about activating the senses, and will entertain your toddler or preschooler for a good long time. Guaranteed. 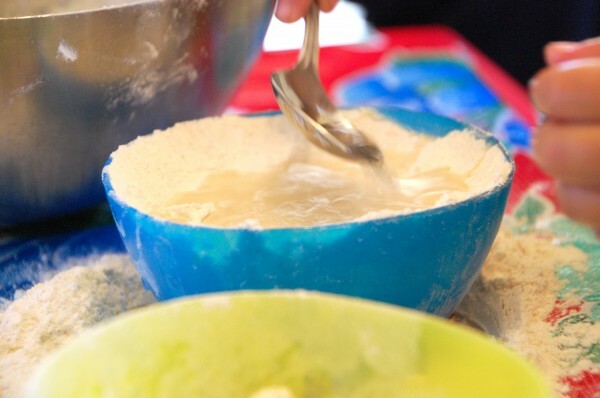 Before you get started, be prepared for a bit of mess, although nothing too cray-cray since it’s just flour and water. I set us up in the kitchen and placed the materials on a low table covered in oil cloth. Pouring water with a spoon. My daughter started by pouring all of the flour into the large bowl and mixing it dry. After playing with it for a bit, she requested more flour. I gave her two more bowls, one white and one wheat, and we talked about the differences for a moment before the scooping resumed. 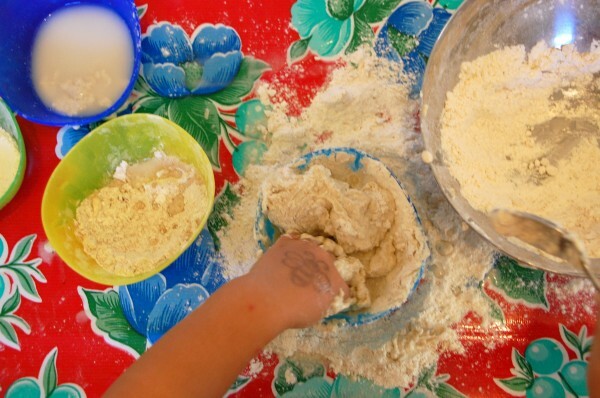 After moving all of the flour into the large bowl, she scooped it all back up with her spoon and divided most of it up into the little bowls until they overflowed. At this point the water was still untouched, which really surprised me as I imagined she’d hastily dump the water in the large bowl in one big pour. Instead, she gently poured the water, spoonful by spoonful, into a small bowl of flour and mixed it in. And she was very careful to keep her hands clean throughout! No surprise there, as my child is obsessed with napkins and tidiness. At the end of it all, she asked for a mid-day bath, and my trusty assistant/Mother-in-Law and I were more than happy to oblige. Fill a tub with beans, rice, or sand. 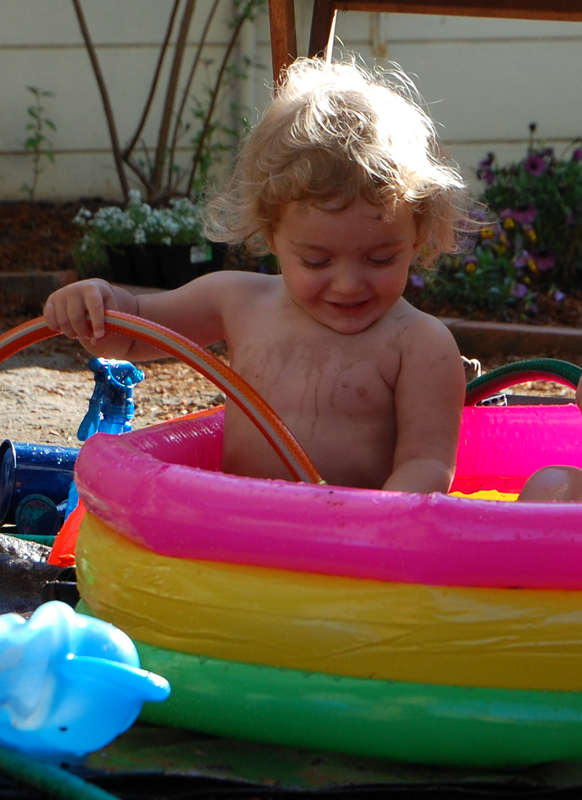 Offer your child small bowls and scoopers for filling and dumping. 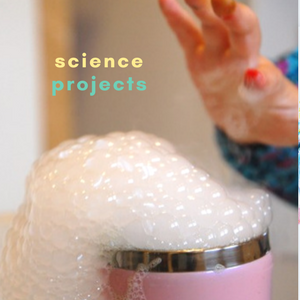 Mix corn starch and water. What a strange feeling! Play with ice cubes in a warm bath. Shine a flashlight or experiment with a glow stick in a dark room. Okay, I’ll be honest. If you want to keep your home clean or you have a fear of “the mess,” this may not be the post to read. Today we played with glitter, and the stuff can get everywhere! The initial plan was to use some glitter glue, but as I squeezed the bottle for our trial run, a crack in the bottom of the bottle split open, causing a mound of glitter glue to ooze all over my hand. So, with a glitter-eager toddler awaiting this highly anticipated moment, I was obliged to pull out some shakers of real glitter and the show went on. The upside here, for anyone who’s feeling less than enthusiastic about embarking on a glitter activity after reading my report thus far, is that N LOVED playing with the stuff. And, if you choose to go the glitter glue route, there’s barely any mess at all. 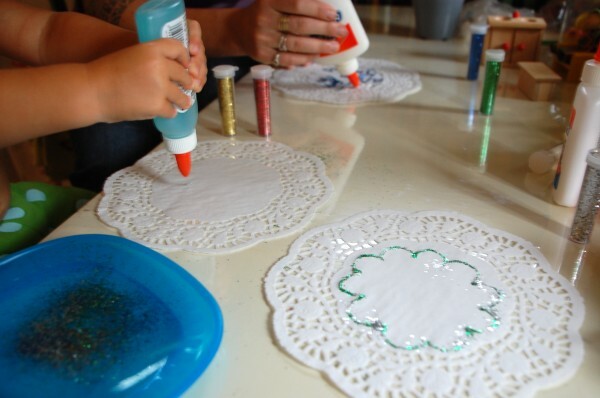 We had some doilies left over from our Doily Drawings so we used them as the substrate, but any 2-D surface will do. Actually, the holes in the doilies posed some glitter-shaking problems, and I’d probably shy away from them next go around (although there is something pretty about lacy doilies and shiny glitter). With a two-year old, there’s only so much you can do with glitter, but if you have older kids, you may like to try making glittery fairy wands or glitter leaves. And if YOU are giddy for glitter too, Martha Stewart has a whole slew of Halloween glitter activities that will keep you busy for the next few months. Finally, if your child likes glitter like mine does, it’s a great embellishment for just about any art activity. Think of it as an art accessory. We did this activity for a few reasons. My daughter had yet to use glitter, and the novelty of a new materials posed all sorts of opportunities for exploration. The steps involved with working with glitter are somewhat involved, and the process requires patience and focus. My initial plan was to use glitter glue and then introduce the glitter shaker on a subsequent day, but the plan fell through. The reason for this is that I’ve noticed my child is bonkers for shaking things out of littler containers (candy sprinkles, parmesan cheese, cocoa, cinnamon, etc.) and it was apparent that shaking glitter would be a natural extension of her current fascination with shaking and sprinkling. The visual payoff can be striking, and kids may be wowed by the shimmery effect of the glitter. Glitter-Glue or Glue & Glitter Shakers. You can find glitter in craft stores, and I’d recommend buying stuff that’s specifically in the kid section because it’s less likely to be super fine and/or toxic. Buy a few colors if you can. 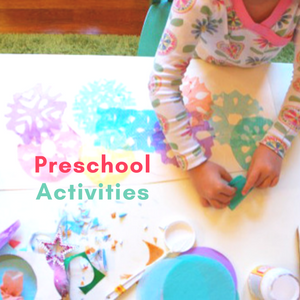 If you’re using glitter glue, show your child how to use it, and let him or her explore how the material works. 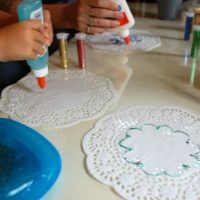 If you’re using glitter AND glue, show your child how to squeeze glue on the paper, gently shake glitter over the glue, and then shake the extra glue off and onto the plate or into the trash can. Please join the conversation…Despite the comment instructions below, there’s no need to register to add a comment! If you’ve been following me, you probably know that I love introducing my daughter to a variety of media. When I went on maternity leave a couple years ago, this little dry erase board came home from the office with me, and it’s now a spot where N can freely draw while we brew our morning coffee and heat up oatmeal. We also have the Ikea easel, which has a dry erase board on one side, and this moves freely between N’s bedroom and the living room. 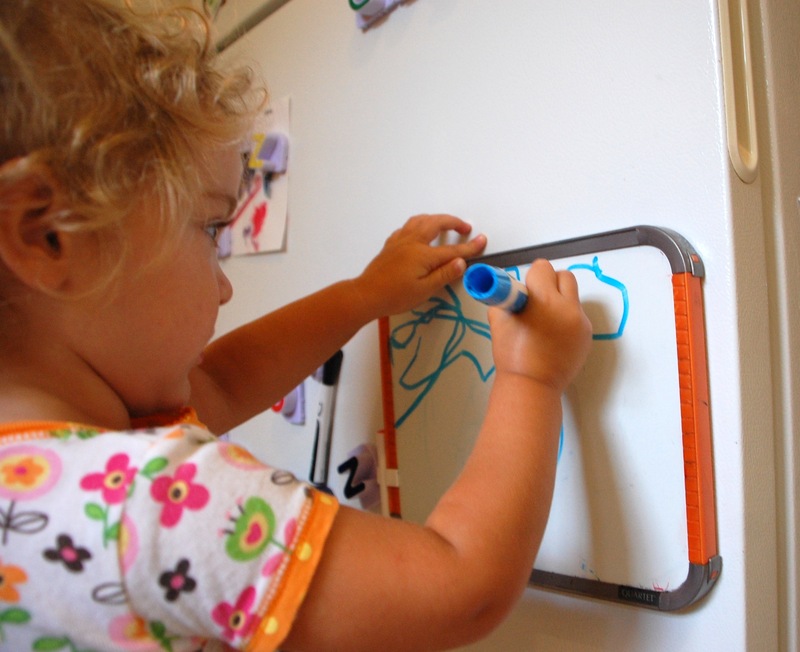 Dry erase drawing is great because it’s temporary, easily wipes up when a drawing is complete, and the pen moves across the smooth whiteboard surface in a fashion so different from markers. Watching my daughter draw in this medium, I see that her ideas flow freely, one idea emerges into another, and when she’s done, a simple swipe of the eraser allows her to begin all over again. 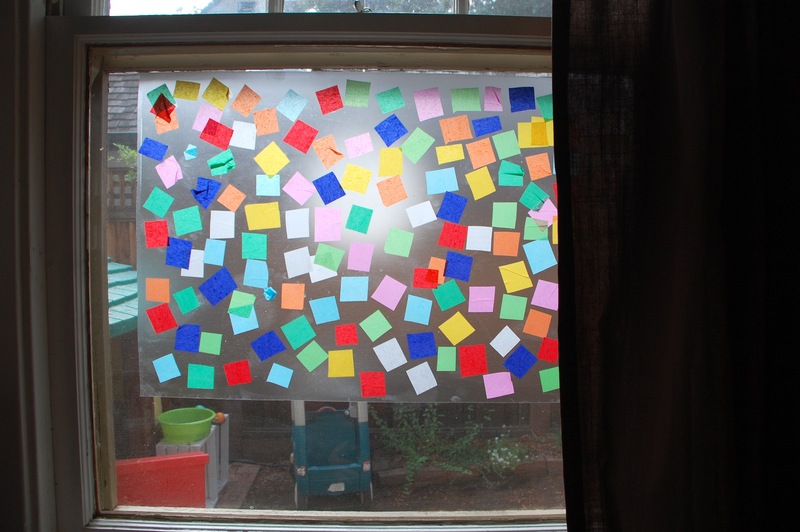 It’s like brainstorming at the toddler level! 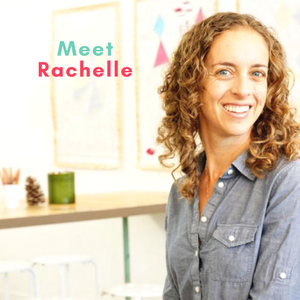 Plus, on a large scale, drawing on a white board is a lot like drawing on a wall — without the cleaning nightmare associated with all of that. Related to this, my husband, Scott, happens to co-direct the Environments Collaborative (i.e. 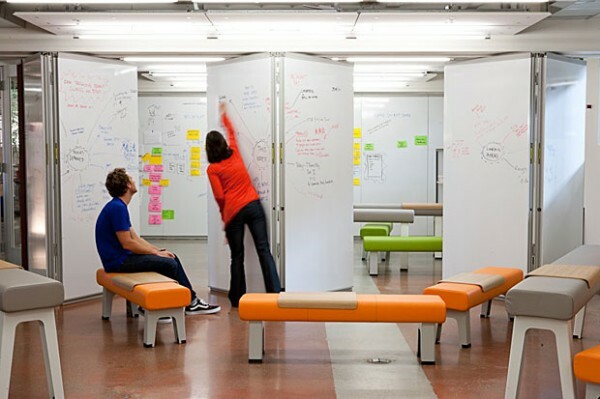 he designs the interior spaces) in the incredibly creative Stanford Institute of Design, where dry-erase boards hang freely in place of walls (see photo above). They even have an entire room (called the White Room — surprise, surprise!) 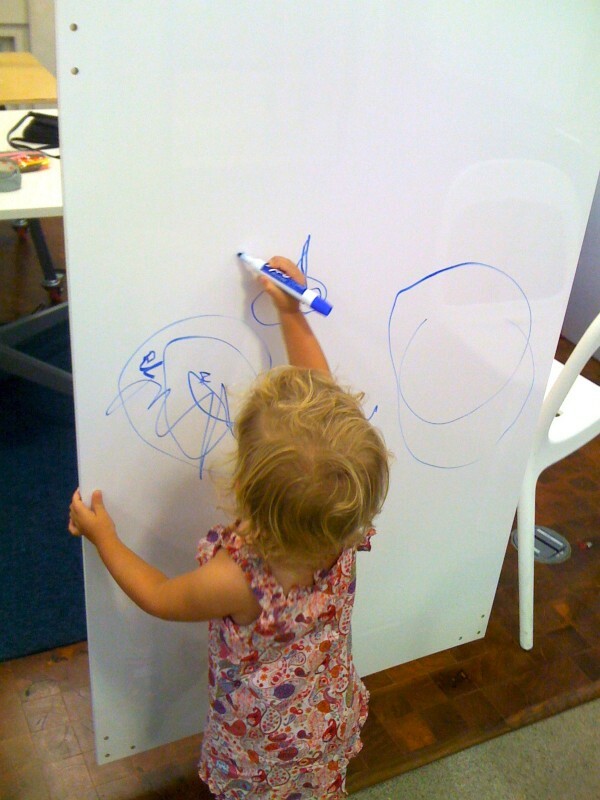 dedicated to whiteboard-style brainstorming. 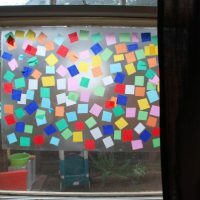 My daughter BEGS me to visit her dad at work, and while I know it’s because she has a huge heart for her dad’s affection, I assume that part of this longing must also have something to do with the endless supply of post-its and sea of whiteboards that stretch from one end of the building to the other. Cleaning up our mess. so we’ll get invited back! And finally, it will take a bit of hunting, but you can also find nontoxic dry-erase markers, such as these from Expo. 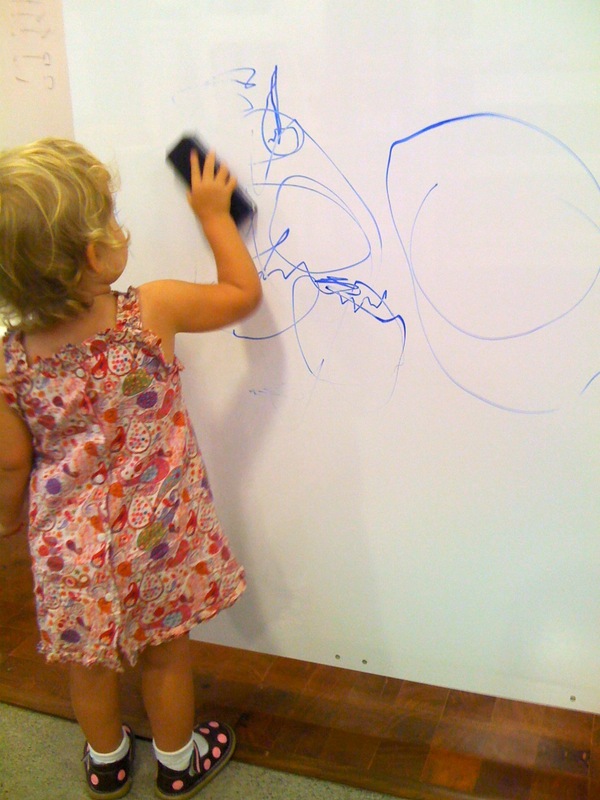 Have fun drawing on this glassy surface, and please share your whiteboard drawing/brainstorming/creating/exploring tales!